Chen Chieh-Jen, Factory, 2003, single-channel video installation. Photo courtesy of Chen Chieh-Jen. Note: This article was first published in Chinese on the 63rd issue of the Art Critique of Taiwan. The newly translated English version presented here is part of the special online issue to mark ACT’s editorial transformation into the 10th year. This article is a rewrite based on a speech given during the Forum “Image vs. Landscape” at the China Academy of Art on June 6, 2011. The style of a speech is preserved but works and events discussed in this article are not limited to 2011. Chen Chieh-Jen: Friends, ladies and gentlemen, good morning. Today, I’d like to talk about some thoughts about how the dissenting image movement move “from a confrontation strategy to further qualitative change” inspired by the Documentary The Mass Funeral of Wei-shui Chiang. It is widely known that in 1895, the Lumière Brothers publicly screened the first ever celluloid film in human history in a cafeteria in Paris. That year was also the first year Taiwan became a Japanese colony. From the perspective of Taiwanese history, the birth of films and colonial modernity has a twin relationship that is not purely accidental. However, if we take a closer look at this twin relationship, we’d find that the colonized could always, from the fraction of the ruling model, develop other imaginations and resistance methods outside of the ruling model. Chiang el al. founded the “Taiwanese Cultural Association” (1921-1927), and in 1926, established a film touring screening group, the “US & Taiwan Group [Mei Tai Tuan]” that screened silent films (1926-1927). Unlike an ordinary silent film narrator (or an orator, as the Japanese put it), which only described in a vivid manner the content and the plot of a silent film to the audience, film narrators of the “US & Taiwan Group” “misinterpreted” the content of the film and promote to the audience anti-imperialist, anti-colonial, and anti-capitalist ideas. We could imagine a possible scenario from this historical case: for the colonized (the audience) who could not have visual persistence technologies, some kind of imagination must had been inspired from this special experience of “audiovisual split” when they watched the motion pictures and listened to the film narrator’s “misinterpreted” words. What I was trying to say was that, the interaction between the film narrator and the audience was conducted using images and words as a media, but at the same time, such interaction is also a multi-format performance action outside of images and words. It is especially so when Japanese policer officers, who were unable to understand the dialogue between the film narrator and the audience, started to exert their discipline power. The Japanese policer officers were thus forced to become a part of the interaction—when the police officers left the last row they originally sat, which was a high monitoring position, and went between the audience and the film narrator to try and stop the interaction from continuing, they became not only the colonizers visible to and surrounded by the audience, but also “the monitored” under the collective gazing and talks of people. Whether or not the Japanese police officers succeeded in stopping the interaction, at that moment, they were forced to play the dual roles of a colonizing oppressor and a person “being monitored”. The original screening space became a place of transposition between the monitors and the monitored, and allowed the various presentations of art such as sounds, words, theaters, and culture movements, constitute an intertwined and yet conflicting dialectical field. Everyone onsite no longer just had one identity: film narrators of the “US & Taiwan Group” were not just advocates of anti-imperialism, anti-colonialism, and anti-capitalism, but were also facilitators of various dissensus; whereas the anonymous audience were no longer just respondents standing by, but agencies of impromptu scriptwriting and performances. The reason I mentioned this part of history was not just to introduce how, under the colonization of Japan, Taiwanese film narrators used the strategy of “misinterpreting” film contents to develop an outward action to resist colonizers’ attempt to teach and tame the colonized. Instead, I am more interested in the fact that: after the colonized audience watched the silent film, listened to Taiwanese narrators “misinterpreting” film contents, and became an impromptu scriptwriter and performer of the activity, what delay effect could possibly be expanded afterwards? Compared to colonizers that controlled the visual persistence technology, the colonized who, then, did not have the condition to control filming tools, after the special “audiovisual split” interactive experience that made them impromptu scriptwriters and performers, when they wanted to relate to others the interaction they saw, listened to, and participated, all they could rely on were their afterimages and reverberations. And certainly, individual perceptional and memorial differences would be found when one relates to others due to different memory and experience. Their afterimages and reverberations were subject to re-interpretation and re-imagination such as subjective addition and deletion, rewriting, and fabrication. And according to the Law of Conservation of Energy, any sounds made will not completely disappear or silence even under constant refractions and reflections; instead, those sounds will continue to expand and spread in frequencies and reverberations to the point our ears can no longer hear. Or, I should say, when a certain or many sources of sounds are spread and collapsed with an object in the real world, the original source of sound will continue to expand mixing with other sounds. In other words, be it afterimages or reverberations, they are not just lingering images or sounds from the past, but ongoing images and sounds constantly generating and changing. Following this train of thought, we can further imagine a movie originally meant for the colonizers to educate the colonized, and yet with an audience “misinterpreting” in their own mind, and further reinterpreting, reimagining, and relating it to others, the movie can be turned into various “rumor movies” that are anti-imperialism, anti-colonialism, and anti-capitalism. The reason I think these “word-of-mouth” retellings are also a type of “rumor movies” is because (1) in modern Mandarin Chinese characters, the word “rumor [Yiao Yian]” is often understood as a maliciously fabricated story that is used to defame others or to destroy something’s legitimacy whereas the word “defamed words [Yiao Zhuou]”, which actually had defaming intention, is rarely used nowadays. The original meaning for “Yiao Yian” in Mandarin is “songs or proverbs circulated in the civil society commenting current issues and politics”. The majority of the contents from Classic of Poetry are from folk songs, and therefore, “Yiao Yian” should mean something closer to the idea of “through poetic languages, songs, and made-up narrative strategies, the public intervene the authorities with ruling power and specific social problems, and thus generate various dissensus, imaginations and techniques different from the perspective of the ruler”. (2) Back then, the “US & Taiwan Group” did not have the condition to produce their own films, but they “misinterpreted” a certain film and created “audiovisual split” film-viewing experience instead of canceling films as a media altogether. Therefore, such method makes it possible to develop a theater into a multi-dialectical field that mixes sounds and images, words, theaters, and cultural activities. Still, there is a problematic we cannot ignore when it comes to afterimages and reverberations; that is, the ruling mechanism also utilizes a variety of theme tunes produced top-down and plants them into the mindset, memory, and perception of the colonized, the disciplined, and the ruled, which produces a much wider afterimage and reverberation than dissensus. We need only to look at the great amount of colonial nostalgia statements that beautify the Japanese colonization period in recent years in Taiwan, and their relevant statements rationalizing colonial modernity, we’d understand that afterimages and reverberations are an entangled field for different consciousness from both the ruling and the ruled, and the subordinated and de-subordinated. It is also a filed the anti-imperialist, anti-colonialist, and anti-capitalist need to go deep to disenchant, re-debate and resist against being reclassified. In short, it is not enough to stop after the discussion of afterimages and reverberations. What is important for us is to develop continuous moving “rumor movies” to help “liberate mankind” from the manipulation and ruling of theme tunes, and create a diversion point and starting point of “self-liberation” through this multi-dialectical process. But I’d like to leave this issue for later discussion. The “Flesh Body” that Ceased to Exist and the Avatars, the Possessed, the Shown, and the Presented. Now, I’d like to play a short clip of the Mass Funeral of Wei-Shui Chiang filmed in 1931 to guide the following discussion. This silent 8mm film, after filmed in 1931, was only made public after its 2005 disc release. Before playing this documentary, I’d first like to thank the descendant of Wei-Shui Chiang, young art historian and critic, Mr. Chiang Po-Shin, who offered me relevant information and this disc. Also, in the 42th issue of Art Critique of Taiwan, published in April of 2010, he wrote an in-depth article discussing this film, titled “1931: Gazing at Death and Visual Files”. The article explains in detail the historical context and social background of the film, while at the same time, delicately analyzes images with multi-layered meanings in this film. I will first cite two important quotations from Chiang Po-Shin’s article to serve as the fundameltal problematic of our later discussion: Under the rule of Japan, “the lives of people in the colony were included in the ruling and management of modern visual technologies”, and this funeral film, “through the pilgramage of body, revered the colozined mirror and formed a view of the public, leaving a visual file of survival and rebirth in that colonized reality. The apparition nature of the file keeps wandering in later generations and looking back at us”. Next, I’d like to invite you to see this clip without first knowing the life and experience of Wei-Shui Chiang. After the clip, I will briefly share with you his life. I think such order allows you to imagine more freely. Or, I should say, the experience of relying only on few words of the subtitles is also an experiment of practicing how to produce “rumor movies”. I believe that without clear historical context, when you saw the film, you’d only know that this is a grand funeral held in 1931 and that such funeral apparently required many “resources”. But what kind of “resources”? And for what reason are these “resources” mobilized? If we base only on the limited explanation in the film, we’d only know that Wei-Shui Chiang is an important figure in Taiwanese history, and yet we still cannot get enough clues to answer the rest of the questions. It is especially so when we saw, in the parade of the funeral, countless figures that were lingering and yet shakyand blurry. This “confusion” is caused by us not knowing what was happening, but such “confusion” may also trigger viewers’ desire to solve their questions in mind. Therefore, spectators, when facing this seemingly simple film without a clear narrative, have to decide whether to be the agent themselves and to find out who Wei-Shui Chiang is, and why those blurry crowd would gather at the funeral? What I was trying to say was that, in our time, we are already used to films (or works) controlling our sensibilities during film watching, such as providing clever and compact linear, non-linear or purposely distorted narratives, creating various conflicts, contradictions, and suspense among characters and event, and providing unexpected endings. And with more and more sophisticated “emotion scheduling technique” and “thrill device”, audience are tamed and become notified receivers rather than explorers of the unknown without realizing it. Thus, contemporary ruling techniques take advantage of these seemingly “naturalized” habits. Even films which claim to be of liberation ideas still often fall to be providers that consolidate such habits. At the moment, facing this silent film, I will temporarily act as a silent film narrator and offer my partial imagination and “misinterpretation” of this film. What I was trying to say was that I am not a historian and I think the actual situation of Wei-Shui Chiang and the history of the “US & Taiwan Group” shall still be explained by historians. What I am interested in is how we can allow those problematics that touched me to continue to be expanded and imagined even though the imaginations of mine may not necessarily conform to empirical history. Wei-Shui Chiang was born in 1891. In 1910, Chiang got into Taiwan Sotokufu Medical School under the Japanese colonization period. In 1911, Chiang joined the Taiwan branch of “United League [Tongmenghui]”. In 1913, Chiang was angry at Yuan Shikai’ stealing the country and planned for his assassin though failed. In 1915, Chiang graduated from Taiwan Sotokufu Medical School with the second best grades in his class. In 1916, Chiang established the Da-an Hospital in Twatutia, Taipei. In 1921, Chiang established the “Taiwanese Cultural Association” and served as the publisher and editor of the Taiwanese Cultural Association Newspaper. In the first issue of the newspaper, Chiang published the article “Clinical Notes”, hoping to diagnose and treat Taiwan through culture and education. In 1922, Chiang organized the “New Taiwan United”, which is also the first political association in Taiwan’s civil society. In 1923, Chiang resumed the position of commissioner of the “Petition Group for the Establishment of a Taiwanese Parliament”, and held a banner requesting the establishment of a Taiwanese Parliament when Prince Regent Hirohito passed by Taipingding. On Dec. 16 of the same year, Office of the Governor-General of Taiwan started the “Peace Act Incident” and arrested over 90 people, many of which are members of the “Petition Group for the Establishment of a Taiwanese Parliament”, and Wei-Shui Chiang was among the arrested. After the incident, Chiang had since been arrested and jailed over a dozen times. In 1924, Chiang organized the “Powerless Assembly” with Lin Hsien-tang and others. In 1926, Chiang opened the “Cultural Bookstore” next to Da-an Hospital; in the same year, Taiwanese Cultural Association established the “US & Taiwan Group”. In 1927, “Taiwanese Cultural Association” divided over the dispute of going left- or right-wing. “Taiwanese People’s Party” was subsequently established. In 1928, Chiang assisted in the establishment of “Taiwanese Labor Union” and served as advisor. In 1931, “Taiwanese People’s Party” was forced to dissolute by the Japanese colonizing government. Chiang thus devoted himself in the training and lecturing of workers, farmers, and proletariats under “nonpartisanship”. On Aug. 5, Chiang passed away in Taipei Hospital of typhoid fever at the age of 40 years and six months. From this simplified chronology, we’d know that Wei-Shui Chiang had started working in the organizing and connecting of anti-imperialism, anti-colonialism, and anti-capitalism underground since the age of 20. And from Chiang’s former comrade describing his passing away as already “poor and leaving only a few books and yet his sons and daughters were still young and in school”, we’d understand that he had run out all his assets devoting himself in the anti-imperialist, anti-colonialist, and anti-capitalist movement. Therefore, it was impossible for his family to have the material condition and hold such a grand funeral after he passed away. Then what was the reason? What was the reason that gathered at least 5000 people to participated in this mass funeral? I think it is easy to assume that the majority of them came from the heterogeneous “people’s power” Chiang accumulated in the establishment of “Taiwanese Cultural Association” and his long-term effort in connecting and giving speeches for various anti-colonial groups. Such “people’s power” further gathered all the “resources” required for the funeral. The reasons I use the subtitle “The ‘Flesh Body’ that Ceased to Exist and the Avatars, the Possessed, the Shown, and the Presented” in this chapter are because of the following. I’d like to begin with historical facts, which constitute the first layer: Wei-Shui Chiang died of typhoid fever, and back then, any “body” died of infectious disease must be cremated immediately; therefore, in the “mass funeral”, Chiang’s “flesh body” was not there, and was “present” in a different form, that is, ashes. And it is exactly because Chiang’s “flesh body” was not present, the crowd participating the funeral became all the more like “avatars” that link with Chiang’s spirit of anti-imperialism, anti-colonialism, and anti-capitalism. Or, I should say, they were “seen and present” at the funeral because they were “possessed” by Chiang’s spirit. It also made this “mass funeral” pilgrimage happened in 1931 when Japanese imperialism had controlled over Japan and its colonies became an alternative political parade because of the “presence” of the “bodies and the mass”. Under the rough reality of ban on assembly and parade, survivors of the colony were able to gather and revive through the funeral. The second layer is: when I say “avatars” and “the possessed”, I am not saying those 5000 people did not have their own individual consciousness and differences. I am saying that in addition to their differences, there were also these connections among them, and it was exactly because of those subjective consciousness and differences that made the “avatars” and “the possessed” not simple subordinates without imaginations, but agents that might expand and start other anti-imperialist, anti-colonial, and anti-capitalist movements. Thus, we can continue to imagine that the crowd that participated in the “mass funeral”, meaning at least 5000 people, through their own afterimages, reverberations, and mobility, could develop into more than 5000 versions of “rumor movies” with different aspects and are constantly changing. Those “rumor movies” are an alternative visible or invisible audiovisual movement no ruling form can completely ban, eliminate, or obscure. I used this documentary to initiate our discussion because: when we think about how we connect contemporary dissenting “body and crowd” and how, under neoliberalism, we regain our time of imagination and mobility deprived by contemporary political and economic structure and biopolitics, it is perhaps plausible to find an inspiring method to “further qualitatively change” the current political and economic structure and biopower through The Mass Funeral of Wei-Shui Chiang and the historical case of the “US & Taiwan Group”. What I was trying to say was that to me personally, the actually start of Taiwan’s modern and contemporary art is from the dissensus actions of the “Taiwanese Cultural Association” and the “US & Taiwan Group” and their cultural dramas. Or, I should say, whatever Wei-Shui Chiang or known orators Lu Bing-Ding and others had in their imaginations (or whether they meant to enlighten rational centralism), consciously or unconsciously, these people started problematics and a way to produce cross-field cultures, which, in today’s point of view, are of inter-era significance. If what Chiang Wei-Shui and the others faced in their time was tough but visible colonial ruling, what we face today is a much more complex and unfixed form of ruling difficult to differentiate the internal and the external, and the colonizers and the colonized. It is especially so when former US Secretary of State Hillary Clinton announced, in 2009, that the US would “return to Asia” (although it is widely recognized that the US has never left Asia). A kind of (as I will call it for the time being) new ruling strategy under the New Cultural Cold War has also emerged in Asia. The New Cultural Cold War is different from the old Cultural Cold War in the past under the Cold War context, [Note 2]which was empires supporting pro-American/anti-communist dictatorships (such as South Korea, Taiwan, etc.) and limiting the multiple meanings of “freedom” to whether or not free markets are practiced, limiting the multiple meanings of “democracy” to whether or not the representative democracy is practiced, limiting the complex issue of individuality to supremacy of the individual, and misguiding the embedded dissension in cultural production to the “de-political” ontology of art through their various propaganda institutions. On the other hand, the US forcibly promoting the globalization of neoliberalism, and uniting or forcing governments around the world to implement extreme private ownership policies result in consequences such as the increasing inequality of wealth worldwide. This subsequently leads to worldwide anti-neoliberal globalization movements. The ruling strategy of New Cultural Cold War continues and expands its “using the left to suppress the left” strategy adopted in the old Cultural Cold War, while at the same time, thanks to various post-study theories on political economics, leaders inspired by the New Cultural Cold War turn international joint movements on anti-neoliberal globalization into partial “opposition movements” on regional and local oppression by “mixing” and confusing left and right ideologies through cross-national media and local agents they control. Therefore, late anti-neoliberalism movements are localized and “mixed” with ethnic politics, identity politics, national security issues, and topophilia. That is why in the recent so-called “opposition movement” in Asia, we often see “leaders of the movement” use discourses the left wing in the past used such as direct democracy, participatory democracy, economic democracy, Marxism, and postcolonial theories; while at the same time, adopt the “emotional mobilization model” and build a new exclusion structure by bringing up neoconservative-like ideologies such as ethnic politics, identity politics, national security issues, and topophilia. Under non-democratic oligarchies, these people intentionally ignore the fact that the US takes advantage of institutions and policies such as the dollar standard, IMF, the World Bank, the Asian Development Bank, and the liberalization of cross-border financial capital, and the fact that the US join hands with capitalist governments in promoting the privatization of state-owned enterprises, dispatch of labor, consortium of media, and the manipulation of global online media information are the structural causes for the severe inequality between the rich and the poor in contemporary global society. In fact, these leaders of the “opposition movement”, before and after the movement, jointly go to the US and ask the US, which leads and forcibly implements the globalization of neoliberalism, to adopts more invasive neocolonial and New Cold War actions on Asia. Simply put, just as the America Institute in Taiwan (AIT) bluntly described Taiwan as a “reflectively pro-American” [Note 3] society, it is not difficult to understand that why the leaders of these “opposition movements” would start various movements that seem to be left-winged but are actually right-winged because pro-American and anti-communist education has been planted in the society since the Cold War/anti-communist/martial law period. Even after the martial law ended, the various local agents continue the ideology with a series of re-reform, re-encoding, and re-education. It is also easier to understand, and even with sympathy, why the lost crowds in so many regions where neoliberalist polities are implemented, whilst being pushed by the ruling class into poorness, would once again fall into the trap of “global new order”, led by empires among the fog of “pseudo-liberation movements” produced by neoliberalism and the New Cultural Cold War. Empires and their local agents are never just the face of one ruler; they have all kinds of “pseudo-liberator” masks and discourses diverting people’s focus on core oppression structures. The chaotic situation produced by neoliberalism and the New Cultural Cold War intends not to further promote radical politics, but to deepen the “global new order”. Then, how do we dissemble and unveil the fog produced by neoliberalism and the New Cultural Cold War? The answer may not be as difficult as one might think. In Taiwan, the educational system and the mass media, for a long time, has conspired with each other to deplete people the chance of knowing basic political economics and historical materialism; therefore, anyone who is a genuine anti-imperialist, anti-colonialist, and anti-capitalist need only to patiently translate basic political economics, historical materialism, and contemporary ruling techniques on manipulating individuals’ desire into a more understandable common sense, there naturally will be some “people” connecting with and rethinking these knowledge with personal experience and moving away from the seemingly left-winged but in reality right-winged “opposition” logic produced by empires. They can thus explore imaginations that cannot be classified nor simplified, and develop a dissenting power that is against both local oppression and the “global new order”. Then, how do visual cultural workers nowadays crack this chaotic situation of New Cultural Cold War with discourses and art styles that encompass both the left and the right? I do not have a “universal” method for it. I could, however, through my personal experience and some fragmented thoughts I came across during film-making, talk about “why” and “how” I experiment and practice art in an unsystematic manner. What I was trying to say was that we all know that any method that claims to be “universal” is inevitably exclusive. But what we need now is to know how to practice and experiment a variety of “self-liberation” methods, instead of fantasizing some kind of “citizen sovereign” or art worker to come up with a blueprint for collective liberation. Or, I should say, an individual’s sensible production also needs to go through a multi-dialectical process to develop into an imagination that might resist the “global new order”, the consensus logic, and art regimes. Because of time constraint, today I will only show some still photos of my films before I talk about my unsystematic imaginations. I always start with this map whenever I give a speech. This place is Shuiwei, and you can easily pass this place within 15 minutes of walk. It is a sand bar washed by Jingmei River and Xindian River and a native land for the Lin Family in Xindian region. In 1962, the KMT government retreated to Taiwan after losing the civil war against the Communist Party. In order to settle the great number of military troops and their families from Mainland China, KMT built three military villages in Shuiwei, and thus this half-closed sand bar became a place with complex ethic groups. In this narrow area are also a military court and prison built during the Cold War/anti-communist/martial law period for trialing and detaining political prisoners, a nursing home for the Chinese People’s Volunteer Army captured during the Korean War, a logistic arsenal of the US Army built during the Vietnam War to support the light weapons and bullets needed during war time, a processing zone built when Taiwan was the world’s factory, and illegal settlements where worker of the bottom class live. This is a place you can walk by in a bit more than ten minutes, and yet you can see historical traces of the civil war, the Korean War, the Vietnam War, and the period after 1966 when Taiwan became an export processing zone under international division of labor. It is also a discipline and ruling space constitutes by prisons, military camps, factories, nursing homes, and illegal settlements. By the end of the 1990s, with the construction of expressways, Shuiwei has turn from a half-closed area into a fragmented space split by highways. When I was two years old, I moved to Zhongxiao New Village in Shuiwei with my mother and my older brothers and sisters. I left Shuiwei after I finished my military service at age 22. I seldom went back unless it was new year or important holidays where I had no choice. Shuiwei was a place that I wanted to go as far away from as possible. It wasn’t until when I was 36 years old, which was eight years after I gave up art creation, that I realized Shuiwei was not only the source of my troubles, but the answer to them as well. For over ten years of my life, I tried to forget about everything there, and therefore, when I reviewed this place where I grew up once again, all the people, events, objects, and scents, sounds and atmosphere at different times which I thought I had already forgotten came back to me in afterimages and reverberations. And when they overlapped with the images before my eyes, I realized that this place was not only the source of my emotions, but the start of how I once again produce art. And it was only then that I realized that “art production” is only possible when you constantly conduct dialogues with various visible and invisible realities and people. At the same time, every place, every person, and every event has complex linkage with another place, another person, and another event. It’s a simple truth but it took me many detours to finally understand: no place is absolutely “marginal”; any place that can help us think about contemporary problems are both local, “international”, and “central” outside of existing power mechanisms. I started creating after that. Chen Chieh-Jen, The Route, 2006, single-channel video installation. After I started creating again, my works basically go along the line with the following problematics. It is true that there are instabilities among problematics art workers have in mind before they create works, their final products, and perceptions spectators receive when they see the works, but if artists try to define their works, it often “exclude” other imaginations. Therefore, today, I just want to briefly talk about some of my problematics before creating. Since 1996 when I started creating again, my works can be divided into several phases: in the digital black and white photo series from The Revolt in The Soul & Body: 1900-1999 (1996-1999), and the three-channel film Lingchi: Echoes of a Historical Photograph (2002), I tried to discuss what “the history of the photographed” is, and whether “the photographed” can only become “the captured” of image devices, or there could be a mobility in “the photographed”. In the three single-channel films created between 2003 and 2006, Factory, Bade, and The Route, I occupied an employer’s factory with unemployed workers and temporary workers, sneaked into a foreclosed house, and trespassed into a private dock for filming. I tried to discuss how to turn the privatized space fixed by capitalism and laws into a dialectical space that cannot be “erased and forgotten”. In the subsequent three films, Military Court and Prison (2007-2008), Empire’s Borders I (2008-2009), and Empire’s Borders II–Western Enterprises, Inc. (2010), I used both fictional scenes and online blogs to discuss how to be “opened” and seen in a power space that obstructs and forbids filming under the name of sovereignty and law in empires and countries. I call this building of a fictional scene a “seizing the site” action. Happiness Building and Friend Watan filmed between 2012 and 2013 are an attempt to bridge the divide between on-stage and off-stage and to transfer and turn fictional scenes into a multi-functional filed for screening, exhibiting, performance and public debate through organizing heterogeneous temporary communities. I aimed to discuss the possibility of rebuilding a “friendship society” in contemporary society where individuals have been atomized. The four-channel film Realm of Reverberations, created in 2014, is an attempt to discuss the idea that when social movements are at their low ebb, how do we redevelop a seemingly “set” event into a diversion point or a starting point for “second layer movements” through viewsheds other than the main narrative as well as outdoor screenings that are semi-ritual or of theaters of images. In addition, in performance art I Pirate My Own Work—Free Donation Project (2007-Present), I focus not on issues such as “charity” or “opening up copyrights”, but on how to blur the concept of “discipline of credit” in the “principles of economics” under the “principles of economics” of current art markets and create other means of exchange and trade. Indeed, problematics among these works have a certain continuity and cannot be cleanly cut or classified. As form some smaller projects, I will skip them in today’s talk. Chen Chieh-Jen, Empire’s Borders I, 2008-2009, single-channel video installation. Before I go into those fragmented imaginations of mine, it is necessary to explain my basic attitude towards words and writings: I see creation processes, works, and exhibition spaces as a “to-and-fro space” for all kinds of linkages and debates, and all these imaginations of mine are merely thoughts I have at the stage with regards to relevant experiments. They may, in the future, be rewritten by me; plus, each chapter concerns a series of complex issues and cannot be fully explained in a limited time, and therefore, I will only focus on certain problematics in each chapter and leave everything else for the future, or for re-development and re-imagination if any friend is interested. Chen Chieh-Jen, Friend Watan, 2013, single-channel video installation. In 1977, I was in the second year of vocational high school, studying in the Department of Arts and Crafts. My teachers thought I had dark thoughts and forbid me from exhibiting my works in school. Therefore, I started skipping school and went to libraries outside the school to study. I first knew about Wei-Shui Chiang from reading an article in a Tang-Wai (outside the KMT party) magazine in the library. After I graduated from high school and finished the military service, I spent a few years working in a factory and, in my leisure time, studied in libraries or worked on my painting experiments, installation art, performance art, video and experiment films, etc. based on what I read from art magazines or books without actual experience, understanding the context, or knowing why I did them. Although inspired by the nativist literature movement, I started to doubt why I did these experiments, but at the same time, I was equally doubtful for the realistic aesthetics promoted by the nativist literature movement. Simply put, in the decade from 1977 to 1987, I was full of confusion and I quitted creating afterwards. However, during my time studying in the library, I vaguely learned and realized self-learning, self-empowerment, self-construction, and self-criticism, and I also realized the importance to open to “others”, to learn, and to maintain a dialectical spirit. But of course, I gradually realized all those things during the eight years of my quitting creating, but back then, I did not know how to express them clearly. What I was trying to say was that when I studied in the library, I did not know any of the authors, but I was still learning from “others”. And the contradictory and conflicting ideas presented by different authors allowed me to indirectly learn basic dialectics in the martial law period where books of materialist dialectics were banned. A few years later, the library that I often went to had a fire. After the fire, I once sneaked into the library and found all those books that inspired and confused me were now ashes, and I could no longer tell their differences. I felt released from the confusion; or I should say, the post-disaster site seemed to be telling me to find a different way to learn. In 2002, I came across an opportunity and got a sponsorship from a foundation, and now that I had the condition to film, I discussed with my little brother: if, in the future, we have the opportunity to continue filming, in this era where everyone can produce dynamic audiovisuals with cameras, cell phones, and personal computers and upload them to the internet (meaning that audiovisual devices have become symbiosis of contemporary people, and people can construct personal audiovisual files at any time as a self-media) [Note 4], in addition to thinking about the internal meaning of videos, what are some other possibilities we can include or extend? Back then, I thought I should make the whole process of filming a “filming action” that connects the excluded and dissidents, a self-studied action school, a production that breaks the existing boundaries between professionals and amateurs, and a temporary social experiment on how to organize heterogeneous temporary communities. What I was trying to say was that our imaginations should not be bound by the existing classification logic and limit ourselves only as the producer of a film; instead, we should further explore and extend the multiple meanings of broadly-defined dynamic audiovisuals. Therefore, we should develop the whole process of filming as well as the screenings and exhibiting of the film into a “to-and-fro space” that welcomes linkages and debates with the excluded, dissidents, and audience. These thoughts came to me during the difficult times of mine when my family and friends generously “donated” me. The first experience was how my younger brother made a living on his own: he dropped out of the Department of Clothing Design and went on working in a clothing company in 1993. Within a year, he helped turn a poorly operating company into a profitable one. He then left the job because the employer was unwilling to give employees a raise and share the profit. In 1994, without any deposits, he picked up textiles discarded by relocated factories and started hand-making assemable backpacks. He sold those backpacks on the streets of Taipei to support my living during those years I gave up on art creating. Another experience was in 1996 when I started creating again. Some of my friends who are not from the art circle gave me computers free of charge for me to use, and sponsored me with a portion of their salaries to support my creation. In addition, when I was invited to exhibit abroad and had no money to print my works, they helped me raise money from other people, or translated long-term all the overseas letters for me free of charge. I was even indebted to my friends for getting the sponsorship from the foundation in 2002, but to this day, I do not know who helped me on this one. What I was trying to say was that these friends helped me and did not ask for anything in return. I felt deeply touched because I know how many people are trapped in life’s burden and have to give up on producing works. Their helping me out is just a modest attempt in the hope that at least someone can continue their works. Ten years later when I sold some of my works and wanted to give them some money back, most of them refused to take it. What I was trying to say was that in a modern capitalist society, most of us are deprived of the objective conditions for leisure time and self-sensible production because they have to make a living. And yet I, with the help of the “burdened people”, went through the toughest time of my life. Or, I should say, their actions taught me one thing: one day if I become a person with resources, I shall not forget the fact that there are countless people deprived of their rights to produce their sensible. Then, in this era of various “impossibilities”, in addition to learning how to find at-hand materials and be able to assemble them freely, how should one develop a more organic way of resource redistribution once they have resources? What I was trying to say was that the sensible judgement and classification mechanism built by current political and economic structure, biopolitics and art regime determine whether or not “the burdened” have the possibility to produce their own sensible, and what forms of art creation can be accepted by the art regime. This is our most relevant problem and can only be solved by us breaking this dominant relationship. Even though in the long line of history, what I can do is only to propose a micro practice method but I how any practice, however small it may be, will eventually go a long way in the future. Back then, I imagined the team I worked with as a certain singularity in the current reality, which was to turn cosmic inflation theory into some kind of art and social practice. Therefore, our preliminary work included hosting small reading clubs and photography lessons, and inviting unemployed workers and temporary workers to teach us how to construct when we built the scenes or even participate the performance, etc. These methods all sound very ordinary but to most people including me, who left school or were deprived of leisure and learning opportunities because we strive to making a living, these methods allow us to once again gain some kind of confidence or desire to continue learning through this mutual teaching and learning process. I think one of the conditions to create “self-liberation” [Note 5] is to turn some hidden or seemingly difficult knowledge into a common sense that everyone can understand through collective wisdom, and to transform the original logic of division of labor into a working method that allow people to learn from each other. This way, every individual can experience the concrete practice of from not knowing to understanding, from having nothing to building a scene, from “not able to perform” to realizing the “power of simplicity”, and their mobility can find in themselves a suitable method for “self-liberation”. It takes only a slight shifting of the framework established by existing knowledge and rules to make changes happen. If, duirng the “filming action” that creates “self-liberation”, actions that connect the “others” are needed in addition to building a dynamic self-learning environment and mutual learning production, then, what do these “others” refer to? Before we answer this question, it is clear that we need to go through an internal and external multi-dialectical process to clarify our questions on “why we need connection” and “with whom do we connect”. I call this internal and external multi-dialectical process “re-historization” and “re-physicalization”. On “re-historization”— It is known that there is no world history, national history, local history, family history, or personal oral history without going through the process of being chosen, hidden, excluded, fabricated, and reconstructed. History inevitably expresses the values, desire and imaginations, cultural identitoes and ideologies the narrator or writer intends to plant in readers’ minds. Therefore, from the moment we are born, we are destined to be tangled by various of perspectives of history and are forced to remain in a tension state with various perspectives and argue, debate, resist, or get outside of these views. In other words, the inside of the “self” is always filled with embedded complex and conflicting history concepts. To me, the problem lies not on how to find an attachable “stable history concept” [Note 6] in this endless sea of history, but to create and practice a dynamic historic viewpoint in current economic and political structure and biopolitics, which can help us get out of this alienated situation, and help us find the conditions to create “self-liberation” and to approach the imagination of the future society of “the whole person” [Note 7] proposed by Marx. What I was trying to say was that whether it is empirical or fictional, official or rumor history, macro or micro narratives, histories are like afterimages and reverberations, and the ruler and the ruled, the governor and the governed all adopt strategies to meet the needs of their own class and situation. In other words, history concepts have always been the battle field of different ideologies and imaginations of the future society. Therefore, only when we put the future society imagination of how to approach “the whole person” before current political and economic structures, inside national identities, and outside of our own sets of value and desire structures to form a state of mutual confrontation and debate can we not let current political and economic structures be rationalized, not let national identities that ignore class consciousness “be naturalized”, not let “emotion scheduling techniques” and “thrill devices” of spectacle media run smoothly, and not let the current and the future be kidnapped by the imperial “global new order”. We should ask ourselves, are we willing to be dissidents excluded by the consensus logic in order to defend the most fundamental multi-dialectical spirit? The word “people” is something that is not homogenous and cannot “be represented” based on numbers. As long as there is someone out there excluded, we should allow the word “people” to remain in an unfinished state. Therefore, when we are creating the conditions for “self-liberation”, we have to connect “others” with “others”; i.e., the excluded in current political and economic structures and biopolitics, and the dissidents that refuse to be included in the consensus logic, de-class consciousness national identities, and the imperial “global new order”. In short, only by connecting the “filming action” with the excluded and the dissidents can we develop dissenting history concepts, imaginations and sensible that are multi-dialectical. On “re-physicalization”— “Body” is a complex issue but today I only want to focus on the idea that when “body” is restricted by the “social identity”, how do we liberate the restricted? As you all know, there is every body or conscience has its internalized discipline and ruling mechanism, and internalization is like a habit: it is often a “dark room” that pure abstract debate cannot get into. Therefore, only when we leave the location that we are currently assigned in and go to the field where the excluded and dissidents are can we really reflect upon the internalized part of ourselves and understand how the current political and economic structures and biopolitics manipulate our own experience. What I was trying to say was that to connect with the excluded and dissidents is not to represent the so-called bottom class of the society, but to help us form new dissensus and to start a multi-dialectical “further qualitative change movement” on our internal-self and the current society. In order to avoid discussing “re-physicalization” only on the abstract level, I’d like to first introduce some teams and individuals I worked with, which may make it easier to explain my thoughts: performers of Lingchi include individual small theater actors, noise artists, and students, but the majority of performers are members of the “Taipei Country Unemployed Labor Alliance”. Performers of Factory are female workers of the “Lien-Fu Textile Self-Help Organization”. Bade was performed by performance artists and temporary workers. 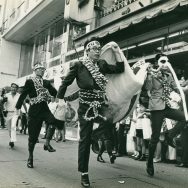 Performers of The Route are members of “Kaohsiung Port Union”. Performers of Military Court and Prison include members of the “Youth for Losheng Sanatorium”, members of unions, “National Federation of Independent Trade Unions” that refuses to register to the government. Performers of Happiness Building are mainly young people without a stable job. Friend Watan was performed by Watan Uma himself. Performers of Realm of Reverberations are residents of Losheng in the “Losheng Self-Help Organization”, a young female that has participated in the “Losheng Movement” to this day but has never joined the “Youth for Losheng Sanatorium”, Mainland spouses, and members of the standing protest movement. I listed out the “social identities” these performers are often recognized in an attempt to say: whether or not they are the parties involved in some event or just ordinary people, there is a certain distance (far or close) between their image in the film and their own self. My idea on the so-called “performance” is closer to that of the agricultural era where during leisure time, farmers would perform local operas to other farmers in an empty space or under the tree. To me, when those formers were self-organizing and performing, their identities were both farmers and some cross-gender role in the opera, or a legendary figure. The moment of performing was not just the moment art was created, but also the moment a farmer was no longer limited to the role a farmer but a person with multiple identities (farmer, actor/artist, legendary figure). At the same time, these self-organized opera performances are also the media of connection during an uprising. Therefore, in the film Factory, even though the female workers are still acting as female workers, they are no long workers at work but unemployed workers, actresses, and thinkers that reflect a certain “inexplicable” mentality. In other words, in the film, they are more like “hard-to-defined people”. Or, in Realm of Reverberations, the most identifiable “social identity” is residents of Losheng Sanatorium, such as Aunt Fuzi, the chairperson of the “Losheng Self-Help Organization”. In the film, when she wandered around with her electronic scooter, stopped at the mountaintop, and started singing to the giant construction site with no one there, she was no longer just a patient in Losheng or a protestor of forced eviction, but a folk singer. Another example would be in the film Military Court and Prison where Chang Li-Pen from the “Youth for Losheng Sanatorium” acted as the anonymous political prisoner. Anyone can see right away that his does not strike as an actual political prisoner with his long hair and contemporary look of a youth, but think of him as a contemporary young man “pretended” to be a political prisoner. Some audience may find it “absurd” but I don’t know if, at the end of the film, the audience would realize that the film tried not to discuss the White Terror in the past, but the contemporary reality where we never get over military courts and military prisons. If there is no such unreasonable “pretending”, the film would become a “reasonable” historical drama. Then, can dissensus still occur? Even the film Friend Watan which is named after Watan Uma, what is the distance between the real him and him in the film? I’m afraid neither him nor I could tell. Then, who is Watan Uma playing? Chen Chieh-Jen, Realm of Reverberations, 2015, single-channel video installation. To me, this has nothing to do with reality or fiction, but to do with the fact that everyone is someone that cannot be identified by their originally recognized “social identities”. In their films, they present an image outside of their “social identities” and can not only change the habit that we tend to see and know the reality, but even create “controversies”. I am often questioned that there are obvious differences between the people in the film and their “actual” identities. In other words, the people in the film do not fit their “social identities” that we originally recognize. However, if workers “or others” can only be limited to their existing “social identities”, should we continue to fix them in their “social identities”, or should we believe that through presenting the idea that everyone is “hard to define”, we are also helping us and them not to be singularized by “social identities”. Farmers that saw “local operas” all knew that this was a fictional opera performed by their fellow farmers because they could be not only farmers but also artists, and they knew that no one could really act like a “genuine” legendary figure. What I was trying to say was that Guy-Ernest Debord worried that “images mediated social relationships between people” and led to “… the moment commodities successfully colonized social life”. But the key to solve the problems of the society of the spectacle is not to cancel image as a media altogether, but to allow people who are deprived of producing their own sensible conditions to take back their right and confidence to entertain themselves through self-organization. The decline of traditional local operas is not about whether or not they are entertaining or if they meet contemporary social needs, but the fact that when our desire is changed by capitalism, we also lose the confidence of being the sensible producer that does not fit “social consensus”. What we should do is not to condemn any carrier of sensible production, but to take back the right and confidence, which is more of an issue of how to conduct desire transfer. In my decades of working, I’ve never seen anyone from the so-called bottom class of the society thinking that the people they acted in the film do not resemble themselves in real life, or that they could or couldn’t understand the finished work; instead, they often think for us and help us find ways to save budgets. To me, they oftentimes are more open than the so-called “intellectuals”, or I should say, since they do not have the classification logic formed by existing knowledge, they can keep a more relaxed attitude towards the film-making process. In some sense, the more we want performers to fit their existing “social identities”, the more we are strengthening the ruling of the society of the spectacle. At the same time, when I worked with these friends, their complex life experience not only entered my memory, but also “possessed” my body. On scenes— To me, scenes, be it real locations or fabricated sites, are never just scenes we temporarily borrow or build for narrative purposes, but the “social sites” we live in. What I was trying to say was that except for Lingchi and Empire’s Borders I where they were planned before finding suitable filming sites, the other films were inspired by my occasional encounter with someone, some event, or some place. They inspired me to think about their relationship with me. But I would only start to think about doing something about it after a long period of time when I encounter a certain “inexplicability”. An example would help with the explanation. Take Factory for example. when I was filming Lingchi, through the introduction of a friend involved in labor movement, I came upon an opportunity to get inside the factory of Lien-Fu Textile and took some shots of the female workers from the “Lien-Fu Self-Help Association”. Afterwards, I got acquainted with the female workers and thought that I should show them the videos I made. Therefore, we started an open-air screening for three consecutive days. That was the start. We subsequently stayed in Lien-Fu Textile Factory from the end of 2002 to 2006. Back then, legally speaking, Lien-Fu Textile Factory was still the property of the employer and the large factory area was guarded by section chief and managers hired by the employer. At first, we could only wander around the area but could not get inside the factory sealed by the court seal. But then we got acquainted with the managers and they opened the factory gate and allowed us to visit. Since then, we could go freely in between factories and when I was about to film Factory, they hid this fact from the employer so that the female workers and us could conduct film-making inside the factory. I eman, those managers are also laborers and they also felt for the female workers when the employer maliciously closed the factory and refused to pay them pensions, severance pay, and wages. When they began to trust us, they allowed us to “occupy” the factory and gave me the opportunity to keep the factory space that belongs to the life history of female workers in the film. It had been over a year from the first day I stepped inside Lien-Fu Textile Factory to the day we started filming. When I first stepped inside the factory, remains from when the factory was maliciously closed six years ago were still there. The calendar, newspaper, punch clocks, working tables and chairs, production facilities, and fans from six years ago, and dust and stagnant dirty air accumulated over the past six years, and the amplifiers, speakers, and protest banners left from during the laborer protest made this factory a space with multiple timelines where “stagnation” and “flow” coexisted. It also made the factory look like a time cluster where different time periods tangled together. Afterwards, in addition to chatting with female workers, we stayed in the factory from daytime to nighttime. In that empty factory, it seemed that one could still hear the chatting and laughter of female workers from when they were working. Sometimes, when we touched the tables, chairs, or objects used by the female workers, it seemed as if we could still feel the temperature of the female workers. I don’t know if this counted as a type of field research, but I feel like only when the six years of dust infiltrated into my lung, or after darkness when the whole factory fell into the dark, I could still identify every object in the site and walked freely am I really a part of this environment. What I was trying to say was that for a person like me who grew up in a period when Taiwan was the world’s factory, with a bigger sister working in the production line all her life, and myself also once worked part-time in the production line, Lien-Fu Textile Factory is never just a film-making site or a so-called “ruin”; it is also a “social site” where countless workers were deprived of the opportunity of being a “whole person”. To this day, I still believe that the dust inside Lien-Fu Textile Factory still remains stubbornly in my lung and refuses to be dissolved by time. As for Bade and the other films I created afterwards, I only started to think about creating them into films when the environment and the people living there started to allow me to “see” images outside the viewshed for reasons I cannot tell. On sneaking in— Some parts of Bade were filmed in a foreclosure house that does not allow entry. Although the law sometimes seems like an impassable line or a labyrinth without exit, sometimes, with a single rip, the seal that symbolizes law falls off right away. What I was trying to say was that “law” is oftentimes “vulnerable”. And when we find its “vulnerability”, we can easily cross it and find that behind the “law” is a “no man’s” land and an area for temporary heterotopia. Therefore, filming Bade to me is like a journey of crossing the forbidden zone of law, entering a no man’s land, and building a temporary heterotopia. On “crossing the border”—When we filmed The Route, half of the film was shot in a public space and the other half was shot at a “privatized” port. Without the permission of the employer, we would not be allowed to go to any “privatized” port. Therefore, I went to one of the workers managing a “privatized” port and talked to him about my film-making ideas. He immediately replied, “my boss will not be here these couple of days. You can come and shoot whenever.” The filming took three days and one day was at the “privatized” port. However, without the actual “crossing the border” of the worker, we couldn’t enter the space of the “privatized” port and the fictional strike in the film would not have its reality basis. Fiction cannot only come from imaginations. A more important reason is that, in real life, there are always many restricted zones, and that is why we have to “cross the border”. On “seizing the site”— The first time I used onsite waste to construct fictional scenes was during the shooting of Military Court and Prison. Even though when we were shooting Military Court and Prison, the site was no longer a national violence space of trialing and detaining political prisoners, the whole place was still locked by state power and was about to be rebuilt into a human rights museum. Back then, some intellectuals were heatedly discussing issues of using human rights museum to conduct “transformation justice”. However, most of the discussion simplify the transformation of bourgeois democratization from before to after the lifting of the martial law to how the previous authoritative regime ignored contemporary human rights issues, how to form a new ruling regime after bourgeois democratization, and the affiliation relationship between the martial law regime and the structure of Cold War. However, if we do not face the fact that the White Terror during the Cold War/anti-communist/martial law period was a discipline and ruling construction conducted by empires and their subordinate dictatorship regimes, and their attempt was to clear the left wing and the dissidents to complete their task of moving from thanatopolitics to biopolitics, how do we explain the formation of the social basis that allowed the ruling class to successfully promote neoliberalism after the lifting of martial law? At the same time, the oppressing purpose of the White Terror on the left wing and the dissidents was exactly to conduct a “blockade surgery on the thinking ability of the brain” to people outside of the prison, so that in an environment where people did not have the opportunity to conduct a conversation with the left wing and dissidents, people gradually lost the ability of imagining a different set of values and other social types. With the development of capitalism and the application of different ruling techniques, people were transformed into the “conspirators” under the Cold War/anti-communist/martial law regime, tamed workers working in factories with low wages, consumers purchasing their consumption desire, supporters of neoliberalism, and “breeders” that continue this “tamed consciousness”. After the lifting of the martial law, Taiwan subsequently implemented several neoliberalist policies and discriminated regulations against migrant workers, foreign spouses, and Mainland spouses. Isn’t this a new invisible prison built by both the ruling class and “citizen sovereigns” who support the representative system? Therefore, I chose to build a fictional scene inside a soon-to-be-torn-down factory and to show the continuous relationship between a past state violence space, a human rights museum in construction, and a contemporary invisible prison through a visible “overlapping shadowed” space. The scene is also a mirror that attempts to reflect the current us that are limited in our imaginations of the so-called “democracy”. Later on, inEmpire’s Borders I and Empire’s Borders II–Western Enterprises, Inc., I continued to build fictional scenes based on similar reasons. The visa space of the American Institute in Taiwan in Empire’s Borders I represents national sovereignty and forbids filming. As for Western Enterprises Inc. in Empire’s Borders II–Western Enterprises, Inc., it is a code name for CIA when, during the Cold War, CIA exercised activities in Taiwan under the name of a private company. The US and the KMT government never admitted the existence of Western Enterprises Inc. and even to this day, no image of the Western Enterprises Inc. headquarter has been published. Therefore, Western Enterprises Inc. existed on behalf of the empire as a “privilege that surpassed the law” while at the same time, it symbolized the empire using its expatriate companies to indirectly indicate its plan to take the world to neoliberalism. Simply put, the American Institute in Taiwan is a sovereign space that does not allow filming whereas Western Enterprises Inc. is a ghost space that has no image and reflects the ubiquitousness and privilege of empires. Therefore, when filming Empire’s Borders I, I built a visa space of the American Institute in Taiwan and the scene of Taiwan’s airport customs entrance. I wanted to “open” those forbidden spaces controlled by national sovereignty and turned them into “sites” that the audience can see. I presented these two “sites”, the first one where a Taiwanese was treated by the interviewer in AIT with rude words and was refused for visa for odd reasons when applying for short-term visa to the US, and the second one where a spouse from Mainland China marrying to a Taiwanese was discriminated against and faced with strict review and checking by the Immigration Agency ever since airport interview. I wanted both of them to speak out their experience of discrimination in these two “sites”. And when I was filming Empire’s Borders II–Western Enterprises, Inc., I had no image for reference. Therefore, I rented a chemical plant built during the US Aid period. In the meantime, I realized that we ourselves are a body that has been disciplined and ruled by empires, and that we are “residues” of empires. Therefore, I followed my own “body memory” to imagine and construct scenes of the Western Enterprises Inc. But if Western Enterprises Inc. is an invisible ghost space, why do we still need a physical scene? To me, from 1950 to this day, we have never left this invisible Western Enterprises Inc., and therefore, I built it to allow us to “see” the internal mental structure of why we are willing to be a subordinate of empires for such a long time. In the more recent Happiness Building and Friend Watan, in addition to turn the fictional scenes built by heterogeneous temporary communities into a multi-functional field for screening, exhibition, sound performance, and public debate, more importantly, I wanted to see the possibility of adding a temporary internal “extra-territory” different from the “objection” model in this contemporary neoliberal multi-ruling models. What I was trying to say was that if we involve various dissidents into this temporary “extra-territory” for intense debate, is it possible to expand more imaginations? When I filmed Realm of Reverberations in 2014, I no longer adopted the method of building fictional scenes; instead, I focused on how the site of “Losheng Movement” had been torn down by more than 70% because of “fictional” development desire, how we build new diversion point and starting point around this “hole”, and the possibility of developing a “second layer movement” after Danfeng Mountain has been excavated into a “hole”-like giant construction site. In the film industry, setting up fictional scenes is nothing but common. It is usually listed in the realm of art design, or included in the behind-the-scenes footage to show the audience the great amount of budget, manpower, and professional production required to build a certain fictional scene. However, to me, a broadly defined scene is not only about how we “qualitatively change” the ruling nature of social sites, but also a speech field that produces dissensus. And building fictional scenes is definitely not just about completing behind-the-scenes footages, but about how an ordinary person creates their own speech space through their own labor. More importantly, are we to follow the existing cognitive framework offered by the film industry and to only see it as a behind-the-scenes footage, or are we to see labor of different phases and levels as different aspects and problematics concerning “what creation is”, and to see these different phases and levels of labor and creation equal? Images and sounds are both issues that can be discussed endlessly, but I myself seldom talk about images and sounds, and I don’t even write artist statement to image works; instead, I co-write basic background and context introduction of works with my studio colleagues. The reason I seldom talk about them is because, images, especially dynamic images are the most complex carrier and media that can be multi-interpreted among all medias. It is better for creators to keep a certain distance with their own works. Therefore, today, I just want to share with you some external thoughts I have regarding dynamic images, and will not talk about dynamic images themselves. Pier-Paolo Pasolini once said, “life is a long shot”. We can rewrite it into “life is a combination of countless montages”, or, “life is the endless flow of sounds and images in the stream of consciousness”. What I was trying to say was that a person is an audiovisual device with extreme complexity, and the imaginations trapped inside our body can only be released at a certain level after the subsequent invention of filming, fixing, projecting, recording, editing, mixing, compositing, and playback devices. However, audiovisual devices, like all the tools invented by human beings, are double-facet (or multi-facet) like drugs and poisons. In short, the history of images and vaious image theories are like a history of debate with no conclusion. But I think after this speech, you can all go back and read those histories and theories yourselves, so I will start with my own experience and imaginations. I saw some so-called “art films” when I was young, and often felt drowsy in the theater. I didn’t see many of those films again afterwards but many years later, when I couldn’t remember the plots for most films, the atmospheres and scents of some scenes are still in my mind even though I could no long remember what the stories were about. Why could they remain there and keep on returning back? Honestly, I’m not sure. We can probably provide some meta-explanation or interpretation by looking at the performance of the actors, the presentation of light and shadow, the moving of cameras, the method of scene change, the connection between scenes, or the effect of sounds and languages penetrating into images. However, none of these can actually explain how those images are produced. What I was trying to say was that perhaps those images with “inexplicable” atmospheres and scents are the “real images” in contemporary society where images have become ubiquitous. They cannot be replaced by other images, nor can they be included in plots, words, or concepts; moreover; they cannot even be replicated by the same author. I prefer to believe that the reason those “inexplicable” images appear is because an author or a few people feel the unexplainable bodily experience from the scenes after living with the environment, the people, or the event for a long time. This statement can be easily misunderstood as mystifying image production. But what I was trying to say was that if, in my films, some scenes have this kind of “inexplicability”, it is not because I “thought of” them, but because I gradually “saw” them after I get along with the environment, the people, and the event for a long time. In short, before I “see” these “inexplicable” images, I am not ready for creation, but when I “see” them, I tend to discard the ideas I have before because those ideas, concepts or narratives that I “think of” often fall into some kind of “wit”. Therefore, I’d rather change the whole narrative of the film into a simple one, or even a “broken” one for those “inexplicable” images. It is hard to explain this working method with words. Therefore, I’d like to try and explain it with my latest experience. Before I officially filmed Realm of Reverberations, I went to the remains of Losheng Sanitarium countless times until all those most obvious people, events, and objects became normal that I finally felt some vague images appearing. One experience I had was: every time I walked by a modest forest I always had this feeling that I had to pause at this place. One day as I passed by and stopped to see this forest, for some reason, I “saw” the image slowing crossing two wooden door relics with no house and paused, and I stared at the half pillar that looked like a tomb among the grass. Sunlight shone through the gaps of the leaves and on this forest, grass, and pillar, giving that pillar an odd color. Portraits of the patients that lived there kept emerging in the darkness after the light went off. When I “saw” this image, there was small rain in the sky and there were no two wooden doors on the site. In fact, all I could see from where I was standing was the steel fence of the distant MRT maintenance plant. When we were about to film this scene, Chang Fan-Chi who stayed six years in Losheng Sanitarium (performer of “Keeping Company” in Realm of Reverberations) suddenly asked me, “Director, do you know what place this used to be from here on?” I replied, “probably a crematorium or a columbarium.” She asked, “how do you know?” I said, “this place told me.” What I mean by that is not that I have special power or I have checked the old map so I wanted to film it here. I just repeatedly looked at the tiny things in the relics until they gradually enter my consciousness and my body. And one day, they re-grow through me. I’ve always believe that “there are emotions in everything” and as long as we are patient enough to enter layer by layer these “emotions”, they will naturally form into images that I cannot elaborate clearly but can feel deeply. Afterwards, these images will then ask me to retreat to a certain distance away because they give me the opportunity to film them not because they want to exhaust these “emotions” but because they want these “emotions” to continue to grow and expand. To me, this “seeing” process cannot be analyzed by materialism or idealism. It is simply a natural bodily experience when one involves themselves into a certain environment to the point that one enters the “inexplicable” place hidden deep inside events and objects. When filming, I follow what I “see” and gradually throw away all “wits”. I don’t even think about whether or not they can be made into a film with complete narrative. Anyways, this is all I can say about what “inexplicable” images are. Crossing this line that I can barely explain, I have nothing further I am able to say. Back to what I can talk about— In this era of ubiquitous images, the society of the spectacle that Guy-Ernest Debord worried seems to become a reality, and far exceeds his then imagination. There is no longer any science fiction film that really amazes us because we are now living in a science fiction film, just as when the Large Hadron Collider (LHC) tries to make and record the origin of the universe. Space Probe “Voyager 1”, after over three decades of exploring, continues to sail to the edge of the solar system and outer space and sends back photos of the space to NASA. Satellites scatter 1,000 to 25,000 km away above the ground, in the sky we cannot see, and observe the Earth’s meteorology and ecology, or perform communications, navigation, detection, guidance, or missile interception tasks. Unmanned planes that can flow at anytime monitor possible attack targets with their electronic eyes, and when the remote executer presses the button of the guided bomb, the camera on the bomb will send back the image to the control room so that the executer can see the live broadcast of the attack until the bomb hits the target and the whole screen suddenly turn into a glaring white light, making the remote executer blind for the disaster caused by the explosion…… These technologies have their contemporary issues regarding images worth exploring but I’d like to leave them here as the introduction for the following discussion so that these tempting issues will not digress our discussion purposes. We are already penetrated by the internet technology, bio-technology, and neuro-technology. We cannot avoid these technologies and are not able to change the biopower brought by these technologies. Our cell phones and personal computers are also monitoring devices that allow empires to monitor us at all times, and the big data is not only a tool for empires and the ruling class to rule and control over public opinions, but also an equipment for capitalism to develop new markets. Robots, in a foreseeable future, will replace the work of most laborers and eliminate the power of traditional unions… Then, what can we do with our ordinary intelligence? One of the possible answers is not to develop a so-called more “democratic” tool (if possible, it may be easier if we can abolish intellectual property right altogether), nor to return to complete handmade production (from the perspective of empires, such individual humanism that is “counter-development” is definitely welcomed), but to place the imagination of how to approach a “whole person” before all other issues. Simply put, only by starting a dismantling, moving, and re-dialectical “further qualitative movement” on our imaginations of desire and sets of values shaped by current political and economic structures and bio-politics can we stop technologies from becoming tools that empires, the ruling class, and multinational corporations adopt to monopolize and rule us. A simple and understandable case would be Edward Joseph Snowden. Snowden’s humble belief is that people in the world deserve to enjoy true individual freedom, and therefore, he revealed “PRISM” dedicatedly built by the US and countless top engineers, leading to the invalidation and reconstruction of the costly “PRISM”. He is even willing to leave his imperial home country and bear the accusation of a “traitor” for this humble wish. However, Snowden also provided us an inspirational method in this era where neoliberalism dominates and rules us. What I was trying to say was that Snowden’s different set of values from empires and their subordinates is a case of desire transfer, a practice of how to approach a “whole person”, and an active case we should share with others when developing the “further qualitative change movement” since spreading this kind of de-imperialist values is something that we can all do. My speech, so far, seems to be a bit distant from the discussion of “images”, but to me, if we do not include issues regarding future society imaginations such as how to create conditions of “self-liberation” and how to approach a “whole person” into the discussion, we cannot avoid the fate of various forms of images that claim to be progressive in the history of image: that is, however progressive they claim to be; in fact, they can be absorbed, qualitatively changed, and filed into the classification logic constructed by the imperial image regime by the current political and economic structure, biopolitics, and art regime. Regarding this, all we need to do is to check the history of changes in classification in imperial image regime (including mechanisms such as independent films, museum images, and new media), and we’d find that montages, streams of consciousness, separation of sound and picture, long shots, and non-linear narratives in the past, and the more niche and diverse experimental films, video art, film art, and multimedia interactive devices can not only be absorbed into the different departments of imperial image regime for re-classification, re-encoding, and re-ordering; at the same time, the imperial image regime only needs to plant new “emotion scheduling machines” and “thrill devices” in these formats, and they can be changed into drivers to help the imperial image regime continue producing “format diversity”. Or, we should limit the discussion of some image experiments that used to connect to radical social imaginations into the discussion of image ontology or multiculturalism. I am certainly not against image experiments. What I was trying to say was that in this era of information overload, anyone willing can find learnable types in the large existing classified image database and put themselves in these classification logics. However, just as the Communist Manifesto stated, “The bourgeoisie cannot exist without constantly revolutionizing the instruments of production, and thereby the relations of production, and with them the whole relations of society.” Therefore, “format diversity” is the core driver that allows capitalism to continue to develop. Our way of getting rid of the manipulation of the society of the spectacle and imperial image regime is not to cancel films as a whole, nor to stand on the opposite side of Hollywood popular entertainment films. If we conduct inspection on the operational model of the imperial imaging regime, we’d find that the various independent films that claim to be anti-Hollywood production model still fall into the classification logic built by the imperial imaging regime. In fact, even from the beginning of creation, they are a part of the whole body. Therefore, to me, the only way to create a multi-dialectical movement and form a genuine “unacquirability” in this ubiquitous imperial imaging regime image production is to create conditions for “self-liberation” and to maintain a future society imagination to approach a “whole person” in image production and to conduct a synchronized and accreted [Note 8] experiment and practice. In other words, we need to differentiate and clarify the differences between dissentibility and “format diversity”. In the era of celluloid films, one key technology of film projector was to put a rotating chopper in the projector, and intermittently blackout the images through high-speed rotation. The film of 24 frame per second is kept at a flashing of more than 50 times per second, making human eyes unable to identify the flashing of light. The filling and insertion technologies in digital projectors fill and insert images before and after in an overlapping manner, making the film 120 frames per second, or replicate images to 96 frames per second, or insert 60 black images in one second. All these technologies are attempt to play videos of dynamic images without flashing. These examples are not meant to return to experimental films and video art in the past through the principle of image devices, or to initiate some find of discussion that “overturns” the original function of image devices.Rather, the images of these image playing devices include black images, filling and insertion images, and duplicating images that we cannot tell from our own eyes, and also contain three spaces of debate for us to discuss how to conduct “further qualitative change”: fracture (temporary breakage of images formed by black images), fiction (insertion of images by computer simulations), and duplicated images (repetitively duplicated single-frame images). This also indirectly shows how the society of the spectacle penetrates into our social life, and how strict and tight is the imperial ruling technique regardless of how image devices evolve. At the same time, this also creates a possibility of carrying out a “further qualitative change”. What I was trying to say was that all places of fractures in contemporary society are starting points of “self-liberation” creation. All formations of fictional fields are places to experiment on the future society imagination of how to approach a “whole person”. And duplicated images are fields for us to conduct multiple dialectics on problems that constantly bother us; the unclassifiability of “rumor movies” and “inexplicable” images are to allows images, an issue that requires endless discussion unable to be re-classified, re-encoding, and re-ordering by the imperial image regime. As long as how to create conditions for “self-liberation”, the future social imagination of how to approach a “whole person”, and how to maintain the spirit of multiple dialectics all exist in our thinking and practice, we can always get outside of the classification logic of the imperial image regime and develop different imaginations and discussion directions for images from different aspects. There is a well-known case in the history of science: two young radio astronomers, Arno Penzias and Robert Wilson, borrowed the large communication antenna from Bell Labs but encountered radio noise they did not known where it was from. They tried everything to eliminate the background noises without knowing that these noises would later be discovered as the cosmic microwave background radiation that confirmed the Big Bang. And every time I see those “inexplicable” images, some faint sounds will also cross my mind, and I, like those astronomers, do not know where those sounds are from, how I can retell this to others, and how I can produce them. Therefore, for the sounds (and silences) in my films, I’d like to especially thank sound artists Wang Ming-Huei and Lo Sung-Tse for their patience and intelligence. Today, I would only focus on some of the techniques we used when I worked with Wang Ming-Huei and Lo Sung-Tse. When producing the sounds in Lingchi, Wang Ming-Huei thought that the film itself already has its own “sound” and any addition would destroy the existing “sound” present in the silent film. He described that such soundless sound induced by the film is like the hearing state of human being when we dive into water. But I feel that in some in some parts of the films, there should still be some faint sounds so that the audience would remain in an uncertain state where they are not sure if this film is a complete silent film, and those sounds that occasionally occur would allow the audience to vaguely realize that they are also the “onsite spectators” of torture. In the end, Want Ming-Huei added a faint skin electromagnetic sound to four scenes in the film, which is only about a dozen seconds in total. Although a lot of people thought of Lingchi as completely soundless, I think without those seconds of skin electromagnetic sounds, a critical part of the film would be missing, because be it torture or images, they are connected to the broadly defined skin and the cutting of skin. From a certain aspect, images are also spiritual skins and are “touchable”. There are only three films related to laborers, Factory, Bade, and the Route, that are completely soundless. I chose so because I experienced the multiple meanings of reverberations from when I stayed in an empty factory, and also because I discussed with the female workers before filming Factory, and they asked if they could remain “silent” during the film. I thought about what they said for a long time. What I was trying to say was that in the history of Taiwanese labor movement, radical protests were adopted such as paralyzing railway or roads. Why would these female workers, who could pick up the microphone and elaborate clearly relevant legal issues, wanted to participate in the performance “in silence”? I’ve never asked them formally about the reason, but I guess the reason they wanted to stay “in silence” is not because they did not know how to say the story, but that they have been telling the same thing to bureaucrats, politicians and the media so many times since 1996, and they have heard too many unkept promises. Maybe that experience inspired them to tell their life situation that could no longer be told with words in a “silent” way. This also made me realize that “silence” can also be another way of “speaking”, and it can even be a form of “speech” without words. Therefore, I kept the whole film “silent” and I did not even include the ambient sound. Afterwards in Bade and The Route, I remained the same logic and kept those films “silent”. Also, a soundless film often produces the mental effect of “delay” to spectators. For instance, in Factory, on one hand, the film is soundless, and on the other hand, there seems to be no moving forward in narratives, and therefore, many people think that each scene is very long. But in fact, they are not as long as the audience may feel. What I was trying to say was that “the sense of time” is a subjective experience that does not equate to the time shown on the clock, and anyone who has worked in a production line would know that the eight hours at work seem way longer than the actual eight hours. Then, how do I let the audience physically feel the thirty years of working on the production line these female workers experienced in a thirty-minute film? I believe the lack of sound produces a certain effect. When I was producing Military Court and Prison, I wanted to use sounds to show the covered state violence in the past, and the new invisible “democratic” violence in this era instead of using words or languages to explain this change. Therefore, I spent a lot of time discussing with Lo Sung-Tse on how to use sounds to show these multiple transitions. In the end, you’d find that the film started with “realistic” sounds of traffic and cars passing by, and gradually changed to unrealistic sounds. For instance, we intentionally enlarged the squeaking sounds of fictitious political prisoners’ footsteps on the floor (a power space) when walking inside the military court and prison, and the faint sounds of flipping through legal books and judgements, whereas the sounds of actual footsteps of unemployed workers were suspended in some kind of floating state. In the middle of the film, unemployed workers started to smash the tin house, making huge noises and forming waves of “wall of sounds”, and when they finally moved the tin house and started to move forward, we mixed the previous “wall of sounds” and sounds of walking and changed them into a delayed sound. Also, since the unemployed workers moving the tin house was filmed in high-speed photography, it seemed like they kept moving forward but kept being squeezed back into place. Therefore, I intentionally kept the scene completely dark for approximately two minutes; the audience could only hear the mixed delayed sound and could not tell if the workers kept moving forward or were squeezed back into place. Towards the last part of the film, we placed the sight of the audience (camera) to the driver’s seat of an unmanned excavator, and along with the large sounds made by the excavator, the audience were led to the front of the tin house, at which point the large sounds of the excavator suddenly stopped to almost no sound. Afterwards, the film gradually had “realistic” sounds. What I was trying to say was that although I am not sure if the audience would notice the meaning of these sounds and the images in different parts of the film, to me, without those sounds, it is hard to show the invisible system in an invisible yet sensible manner. When designing the sounds in Empire’s Borders I, I focused on how to allow those “silenced” discourses to be able to tell their experience of discrimination in a power space we built to “seize the site”. Therefore, we used the most modest way to present the monologues of the “silenced people”. But maybe some careful audience would notice in the last scene of images captured by the monitor, the sound of a person leaving this space of power with their luggage. In Empire’s Borders II–Western Enterprises, Inc., since Western Enterprises, Inc. represents the ubiquitousness of empires and is a ghost space that has “above-the-law” privileges, we tried to think about how to present the hollowness of the fact that we are in it but we have never seen it. Therefore, we recorded the hollow echoes of facilities inside the chemistry factory built during the “US Aid” period, and we mixed these hollow echoes together. Afterwards, we added the sounds of electronic organs to help build the sense of hollowness. Also, in the film, only the soldier of the Anti-Communist National Salvation Army who came back to find his file but failed, and the victims of the White Terror who never had files or records had few lines, the living (Mr. Chen) has aphasia. What I was trying to say was that the fragmented words left by the dead showed fragmented answers to events and yet as the living, we are often people with aphasia and amnesia and are unable to respond. Or, I should say, our aphasia and amnesia state is where Western Enterprises, Inc. lies. As for Happiness Building, since it is not a film but a one-year project that contains many dissenting activities, and I had not time to sort out relevant audiovisual records, and therefore, I could only leave the discussion of sounds in Happiness Building for now. Friend Watan was named after Watan Uma, but I knew from the beginning that it is impossible to really make a “realistic” documentary about Watan, and therefore, all I could do was to film some kind of “non-biographical” and “non-documentary” film based on what I read from Watan but could not really put it in words. That is why for the sounds of the film, they were not recorded onsite, but processed in the post stage of production. Although it seemed that the end results sound very similar to recording onsite, but careful audience may notice that there is almost no noise in the film; in other words, no “sense of reality”. I think not using live sounds allowed the film to keep a sufficient distance from the “documentary logic”. Also, in the film, the long monologue of Watan was initially excerpted from words Watan jogged down in his notes when working in the September 21 Earthquake disaster area. I took those words and made all sorts of associations with my studio colleagues and rewrote them into the final monologue in the film. What I was trying to say was that in Friend Watan, Watan not only played himself but also “us” is a certain mental state. After filming Friend Watan, when the staff cleared out and torn down the scenes in Happiness Building (also the scenes in Friend Watan) and everyone walked to the truck at the entrance, ready to turn off the light and leave, Watan suddenly returned to the empty factory and sang a song of the Atayal. He himself said that this song is about farewell. Sounds in the recently filmed Realm of Reverberations were made by three people including my younger brother. Strictly speaking, none of them has done sound design before, but Xiang-Ling was the user of post-stage sound production whereas Xiao-Pei learned Chinese national music. Realm of Reverberations is a four-channel film and I wanted the sounds in these four channels to be in a state where they could be combined at random and interfere with each other. I mean: when we saw one of the screens, the sounds of the other three would also penetrates, and since the film is not screened simultaneously, and therefore, the audience hear difference combinations of sounds every time. That way, it resembled the current situation of Losheng Sanitarium and the ever-changing world, just like the word “world [Shijie]” in Mandarin originates from sutras, meaning the universe is composed by countless small worlds rather than a unified world. They did a better job than I expected. Most of the sounds in the film are live sounds and the boom operator Chou Zhen recorded sounds in the construction site of the MRT maintenance plant in different periods and provided many useful materials for later production. It is especially so when one night before the event “Realm of Reverberations Returns to Losheng”, when we tested the effect of screening on the hilltop, the sounds in the film mixed with and confronted against the live sounds of winds, forests, machines in the construction site, the echoes in this “hole”-like large construction site, and the traffic from afar. At that moment, I felt the reverberations of calm and, at the same time, conflicting “political sounds” in the air. Sounds, to me, be it shown in a soundless manner or not in my films, sometimes exist in “symbiosis” with images but sometimes are separated from images. But in the end, they all are meant to “speak out” the “inexplicable” spirits and complex “internal discourses” in reality that I could not find words to describe. After the invention of movies, forms and theories developed in different periods of history, on one hand, have been re-coded by the image regime into classifiable and systemized perceptional models and knowledge, but on the other hand, there are always people trying to break these frameworks. In other words, all these forms and knowledge are subject to “qualitative change” and “further qualitative change”. Oranges grown in the south are mandarin oranges but in the north are trifoliate oranges: one thing will always be turned into a different thing because of the infiltration of a certain variable. Or, I should say, the original meaning, current status, and future of the same thing are constantly flowing. Therefore, when I am filming, except for following those “inexplicable” images I “see”, I no longer pay attention to whether a certain filming method was classified into a certain classification in a textbook or film history; instead, I only focus on whether or not the methods approach those “inexplicable” images I see. What I was trying to say was that “inexplicabilities” are variables, and as long as there are variables, the existing classified and systemized rules and knowledge may subject to “further qualitative change”. For instance, none of my films have clear narratives, and the majority of films are filmed in one “site”. Such visual narrative, to me, is close to the “sparse” writing [Note 10] of Wu Daozi in landscape painting, meaning that atmospheres and scents are all I pay attention to, and whether or not the narrative or filming method is tight or falls into what classification is ignored. The moving of the camera (including fixed filming), to me, basically only falls into two logics: “stone rubbing” and “cursive” writings. On “stone rubbing”— When I say “stones”, I do not mean actual stones but those “inexplicable images” I “see”, which means most of them do not exist in reality; or, even if they are people, events, or objects in reality, what I “see” are usually their hidden images or meanings. Therefore, we can only “rub” them and make them shown from the invisibility or the surface through light and shadow, cameras, performers, etc. For instance, before filming Lingchi, I kept “seeing” an overlapping “sceneries” similar to the one described in “Inner Scripture” inside the two wounds (black holes) of the prisoner’s chest of a torture photo. These “sceneries” are also some kind of spiritual structure of us, and therefore, all I could do was to go layer by layer, from external to internal, and from skin to the inside of the prison to “rub” these images. At the same time, during the process, I found that inside these “sceneries” were wounds that can return to the present. For instance, in the building of human labs left by Unit 731 were also two similar black holes as those on the tortured prison. Therefore, I also “rubbed” the scene from inside to outside. Anyways, in these to-and-fro “stone rubbing” processes, all these time periods and senses of time are also “rubbed” at the same time, and are connected and mapped into a time cluster intertwined by different time periods. Another example would be in Realm of Reverberations. Many people don’t understand why there would be a scene related to Mainland spounses, and that it seemed to be overtly distant to Losheng Sanitarium and “Losheng Movement”. And besides mentioning briefly in performer introduction that when performer Liu Yue-Ying was 12 (1966), her father was imprisoned for suspected to be a KMT agent, and in the same year, she was elected as the leader of the propaganda team in a local elementary school during the Cultural Revolution. In 2006, she got married and moved to Taiwan. She worked as a caretaker in a hospital talking care of patients in hospice, and afterwards, she got a divorce and started working as a part-time cleaner. There was no further introduction, but if we still have dialectical association spirits, what are the similarities and differences between the ten years of the Cultural Revolution and the ten years since 2004 of the “Losheng Movement”? Or, I should say, what are the two different types of isolation faced by the isolated Losheng patients and the majority of Mainland spouses excluded from being “citizens”? Or, in Taiwan’s unification/independence debate, has any “citizen sovereign” of Taiwan supported Mainland spouses? Or, under the logic of national security, is it “only natural” to construct a new exclusion structure and create a new set of “Losheng patients”? That’s why I “rubbed” them and relevant problematics. On the day I filmed the spouses singing “the White-Haired Girl”, the majority of the Mainland spouses were still working in hospice care the night before and came to the set without sleeping all night. We filmed the scene from the morning to the evening. And after filming, I asked them if they felt tired. They replied, “not at all, that was a song from our youth, but we dare not sing the song in public in Taiwan”. In fact, not a lot of people in Taiwan know songs like “the White-Haired Girl” and their complex meanings and conflicts behind. What I was trying to say was that “equlity” is an unfinished word and a spirit long forgotten (or discarded on purpose?) in Taiwan where we throw discourses like “freedom” and “democracy” so often. What I wanted to do is to “rub” this forgotten word through Mainland spouses. During filming, I discussed with the camera man and decided that each song would only film once with using hand-held camera, and not pay too much attention on whether or not the lens were focused. I call this sometimes focused, sometimes unfocused impromptu filming “wild cursive” writing. On “cursive” writing— In my films, except for few “wild cursive” writings mentioned above, I seldom had drastic camera movements; in fact, most of the scenes are quite static and neat. Then why would I still think there exists “wild cursive” writing? In short, in a “sparse”-like narrative style that is untight and broken, each single scene or each set of related scenes is not point to any fixed or absolute meaning, which is just like words is cursive writing where letters are linked and strokes are simplified for the presentation of a state, an atmosphere, and a scent. In other words, films constituted by my “inexplicable” images do not have a single or absolute meaning whether the audience see it from one scene or as a whole film. Therefore, I’m not talking about “cursive” writing from a similar-in-shape perspective, and I’m not purposely talking about camera movement from an orientalism logic; instead, I just realize the multiple meanings of cursive writing from my experience of viewing cursive scripts. What I was trying to say was that as much as I enjoy watching cursive scripts, to this day, I’ve never understood a whole article of any piece of cursive script. What cursive scripts attract me are the state, atmosphere, and scent built by those words; or, I should say, cursive scripts are more like an “image” weaved by words, paintings, and body movements. The only film I did not adopt the “sparse” and “cursive” writing filming methods is Empire’s Borders I. To me, the whole process of this film is more like a cultural activism from when I collected the various reasons AIT refused to grant visa to Taiwanese people on my blog, the various comments criticizing me from the US perspective (“reflectively pro-American” files), to when I made in into a film. On time clusters— To me, the meaning of editing is mainly about how to connect the various senses of time and make them into a combining and yet “non-cohesive” state, and about how to let the audience feel “both close and aloof” with dynamic audiovisuals. That is why although all my films seem to moving in a very slow slow tempo, there is no unified editing logic; instead, I mixed many methods, including motion editing, montage, stream of consciousness, etc. And for shorter films such as Portraits of Non-Homeowners, Home Renters, and Mortgage Lenders, it is completed with one fixed camera and welding. I mentioned earlier that I think all forms are subject to “qualitative change” and “further qualitative change”. For instance, I have no objection against continuity editing that some “art film” directors and critics are against. I mean: For instance, in Military Court and Prison and Empire’s Borders II–Western Enterprises, Inc., I use mostly directional motion editing throughout the film. However, after they see the film, the audience will find that wherever people in the film go, they are still inside the imperial and national power space. In other words, such seemingly directional motion editing is actually against the original meaning of classical motion editing. That is to say, motion editing does not really take them anywhere, nor does it induce new conflicts and dramatic events. Therefore, the function of motion editing is canceled by itself, and in turn, tells us that we are in a situation where we are “globally imprisoned and locally in exile”. The majority of my films such as Lingchi and Realm of Reverberations take place in one “site” with people, events, and objects from different time periods. To me, this is not about surrealism or magic realism; instead, it is merely to say that the encounter of different time periods and senses of time, from a certain perspective, is to show that we are all in this “realistic” state, just like the world in our mind is never synchronized with the external world our body is in. Or, I should say, we are always in a variety of time clusters. The politics that editing may arise is in how to allow these forms to leave their original definitions and allow different senses of time connecting with while contradictorily debating against each other. Contradictions allow the audience to gain certain associations and dialectical space through their “close yet aloof” relationship with dynamic audiovisuals. In Taiwan, before movies are officially filmed, there is always an camera-rolling worship ceremony where the staff will pray to Tudigong (Lord of the Soil and the Ground), gods of the four orientations, and good brothers (ghosts), hoping that they can keep the staff safe and the filming process smooth. To me, this is not superstition; instead, it is a way for people to express their respect for the working environment through this ceremony, and a promise that participants will take care of each other. After filming Lingchi, we set an open-air screening screen outside of Lien-Fu Textile Factory and started a screening activity for three consecutive days. During the day time, images were swallowed by sunlight and all one could see was blank, and during the night time, images reappeared gradually. Some female workers and friends participating in the filming were with us for the first day of screening to see the film and have hotpot together, but the two nights afterwards, only stray dogs were there. Dogs’ eyesight is only three fourth of human being’s (not really color blind), and those dogs would sometimes bark nonstop to the film. Maybe in their physical vision, they are seeing a different set of images and film that we could never know. Afterwards, we would always have an onsite screening after we finish filming. This is both a party that we throw to thank all the performers and the staff, but also a farewell ceremony we organize to say goodbye to the “social site” we spend many months and even a year with. The staff and the film will go their separate directions from then on. Many things happened since 2002 when I started filming, some saved a new-born kitten in pouring rain and we took care of the kitten on set; some became couples and got married and have children; many became regular partners I work with; some lost contact; and some passed away in accidents and we could only see them in films. Filmmaking allows me and the staff to form a heterogeneous temporary community. From a certain aspect, cooperative filmmaking is one of the few fields to form a “friendship society” in this neoliberalist globalization era. Those friends who gather together whenever I start filming may not know at first what I am filming, and then, they sometimes are more persistent than me and insist that we should keep the senses of time and speed we feel on the site in the film, and they also insist that these films should remain their screening ceremonies which are outside of existing film industry and exhibition space. After we finished the documenting of “Realm of Reverberations Returns to Losheng”, they all refused to take the money and asked me to donate their pay to “Losheng Self-Help Organization” but I insisted that they should take their pay and as for the rest, that is what I’m supposed to do. What I was trying to say was that some of these friends are already in the film industry and have to shoot many entertainment films or advertisements every year; some of them have never participated in filmmaking; some are unemployed workers, and yet we, with different backgrounds, are linked together because of filmmaking. I’ve never asked them why they are willing to work with me for over ten years, but I think their life experience gives them a certain set of values and persistence to the world. Camera Direct Chien Ming-Chi told me when we were filming Realm of Reverberations that then years ago when he was still the second assistant of the camera director, he was very confused what exactly we were filming on the first day he joined the team. He thought about it for a whole night and said, he knew that “we were filming time and vicissitudes”. Realm of Reverberations Returns to Losheng screened during the 2014 Taiwan International Video Art Exhibition. Although it is impossible to have no fight among people, I came to believe the possibility of a “friendship society” after cooperation of more than a decade. After the activity of “Realm of Reverberations Returns to Lo-sheng”, the staff spent the whole night tearing down and remove the site. In the morning of the second day, Aunt Fuzi, who almost never goes up to the mountains, climbed to the mountaintop and greeted the staff who hadn’t been sleeping all night. The staff then invited Aunt Fuzi to have a group photo with them. I think to them, this is more than just a photo. For more information on the history of “US & Taiwan Group”, please refer to Labor Movement, Vocal Music, Anti-colonialism, Huang Xinzhang, Department of Cultural Affairs of Taipei City Government, 2010, p.44-47. For more information on the history of Cultural Cold War, please refer to The Cultural Cold War: the CIA and the World of Arts and Letters, Frances Stonor Saunders, Beijing, International Culture Publish Enterprise, 2002. This came from American Institute in Taiwan, Document No. 09TAIPEI1196, dating: Oct. 5, 2009. The original sentence was that there were very few places in the world like Taiwan where they are reflectively pro-American. The influence o the US on Taiwan are quite obvious, including culture, politics, economics, and businesses. Another more critical sentence is that from our perspective, Taiwan is the biggest showroom for American soft power. For the whole article, please refer to WikiLeaks Taiwan, edited by Shia Chen, Guo Chung-Rung, Wu Tien-Jung, China Times Publishing, 2011, p.520-523. In 2002, cellphones and cameras still couldn’t film dynamic images, but DV cameras and computer editing are already quite common. This paragraph was rewriteen based on the current situation (2015) of image devices. Back then, I was talking about DV cameras and comput editing, and the possible trends of future image devices. “Self-liberation” mentioned in this article is not about the individual supremacist “self”, but about how every individual can develop outward mobility in “self-liberation”. The End of History and the Last Man is probably the best exemplification of neo-conservatist “stable history concepts” in the past two decades, Francis Fukuyama, China Times Publishing, 1993. “The whole person” is one of the key concepts brought by Marx in Economic and Philosophic Manuscripts of 1844 (1932) and his articles afterwards. For more detailed discussion, please refer to On “the Whole Person”: Study of Marx’s Theory of Man, Pang Shiwei, Beijing, Central Compilation & Translation Bureau, 2009. For more information on the history of “accrete art”, please refer to History of Zaju, Liu Xiaoming, Beijing, Zhonghua Book Company, 2007. And for more information on the imaginational “twisting” of “accrete art”, please refer to Chapter One of my book, Bianwen Book, unpublished. For more information on the history of western sound experiment movements and their reflections, please refer to Beyond Sound Art, Lin Chiwei, Artist Published, 2012. No original works of Wu Daozi’s “sparse” landscape paintings existed. Only descriptions of Su Shi and others on Wu’s works still exist. 11. Concepts such as Michel Foucault’s biopolitics and biopower, and Jacques Rancière’s consensus and dissensus mentioned in this article are common sense in the cultural and art world. In order to keep a colloquial flow in the speech, authors and sources are not specified in the article but noted in this footnote to explain the originators of these knowledge. Concepts such as Michel Foucault’s biopolitics and biopower, and Jacques Rancière’s consensus and dissensus mentioned in this article are common sense in the cultural and art world. In order to keep a colloquial flow in the speech, authors and sources are not specified in the article but noted in this footnote to explain the originators of these knowledge. Chen Chieh-Jen was born in 1960 in Taoyuan, Taiwan, Chen currently lives and works in Taipei. He employed extra-institutional underground exhibitions and guerrilla-style art actions to challenge Taiwan’s dominant political mechanisms during a period marked by the Cold War, anti-communist propaganda and martial law (1950 – 1987). After martial law ended, Chen ceased art activity for eight years, during which he re-examined his family history and experiences growing up to reflect on the trajectory of Taiwan’s modern history. The environment of his youth was surrounded by spaces of discipline, governance and illegitimacy as evidenced by military courts, munitions factories, and convalescent hospitals for anti-communist martyrs, as well as industrial areas and illegal shanty towns.